Thursday February 21st 1895 Will went to a sale and I worked the greater part of the day to sweep the house and dust things. It was a bright day but with a cold raw wind. I read late in the afternoon and evening was tired went early to bed. Friday February 22nd 1895 I got my work done early and we went down to the church where I helped the ladies to serve a turkey dinner. Will come there to eat. After the dinner I walked over home. Will came for me. Hattie was just starting to town. I visited with Mother and Miss Lewis. Came home in time to do evening work. Will helped me wash before ten oclock. Saturday February 23rd 1895 I was busy with the ironing and other work in the forenoon got through in time for early dinner and went to town in afternoon. walked over home and Will came for me. Did the regular work and read all the evening. It is milder and snow nearly all gone. 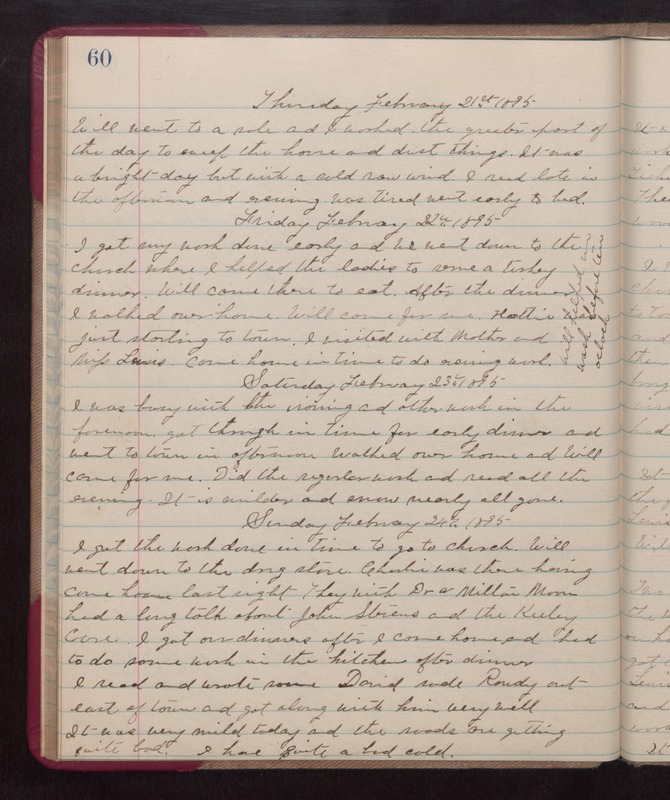 Sunday February 24th 1895 I got the work done in time to go to church. Will went down to the drug store. Charlie was there having come home last night. They with Dr & Milton Moore had a long talk about John Stevens and the Keeley case. I got our dinners after I come home and had to do some work in the kitchen after dinner. I read and wrote some. David rode Randy out east of town and got along with him very well. It was very mild today and the roads are getting quite bad. I had quite a bad cold.